A first half to be proud of...finally. After several lackluster first-half efforts since the loss of Reggie Wayne, the Colts put together an actual first half with scoring and everything! They looked terrific on their first drive, converting a couple of short third down opportunities on their way to a TD pass from Andrew Luck to Griff Whalen. The Colts spread the field and went no-huddle on the drive, something fans have been screaming for, for weeks. You wanna be a power run team? Fine. Get the pieces and make it effective. When it's clearly not working, you have to make a change. Glad to see it. GRIFFNATION! I thought Whalen was a guy who could provide a spark for the Colts. His numbers weren't jaw-dropping: 4 catches for 45 yards and 3 punt returns for 67 yards. Still, he gave the Colts some plays they sorely needed, including a TD grab and a 51-yard punt return that set up a field goal. Look, I know Whalen isn't going to physically dominate anyone. I know he's not the Flash out there. I get it. I still think it's worth having him out there as a third or fourth receiver because he has good hands and is someone Luck won't hesitate to throw it to. A good win, but... The cynic in me has to come out on this win at least a little bit. While it was good to see the Colts put together a good all-around performance (and their best game since the win vs. Denver), we have to remember it came against a Texans team that hasn't won a game since September. The Texans have lost 12 games in a row and have never beaten the Colts in Indianapolis (not even during the Kerry Collins-Curtis Painter-Dan Orlovsky "Era!"). They've fired their coach and are inexplicably in line for the top pick in the draft. Despite the many great pieces on this team--Andre Johnson, J.J. Watt, etc.--they were listless and terrible. I do think the Colts played with some extra fire, but it's hard to gauge this win. A truer test will be next week against Kansas City. A day of firsts. GRIFFNATION caught his first career TD pass. Bjoern Werner notched his first (full) career sack. Trent Richardson caught his first TD pass as an Indianapolis Colt. Antoine Bethea downed Case Keenum for his first sack of the year. The Colts got contributions from guys when they sorely needed to build some momentum toward the postseason. Darius Butler. Remember Case Keenum's first start against the Colts when he threw for 350 yards and three touchdowns? Well, that didn't happen this week. The Colts made Keenum look purely pedestrian, although that's been pretty much the norm for him over the last five games (2 touchdowns, 6 interceptions over that span). They hurried and harassed him, and no one dogged him more than Darius Butler, who picked off two of Keenum's passes and darn near had a third that would've been a pick six. The Colts secondary was physical and stingy overall, and Butler was a major factor in that. He was also credited with three passes defensed. Trent Richardson. I'm not ready to pop the champagne here. But after a decent game last week, Richardson built on that against the Texans. He had a couple big catches and broke a couple runs. The consistency isn't there yet (well, I guess it is, since we're all used to a good one-, two-yard plunge into the line of scrimmage...), but I saw some potential there. Tough running, evasiveness, more decisiveness. It wasn't there on every play...he still got buried plenty of times. Still, there was something positive to take away from this game when it comes to Richardson, and I'll take it. DHB on special teams. The Colts pretty much conceded that DHB was a bust when they handed Da'Rick Rogers playing time. They further diminished DHB's role this week, when I saw him play on special teams. I think he was out on the field in some passing formations, but his role was severely limited. The Colts went primarily with T.Y. Hilton (who had his best game in weeks), Rogers, and Griff Whalen in the receiving corps. We also saw a good bit of Jack Doyle and Weslye Saunders as second tight ends/fill-ins for the injured Stanley Havili. Better line play. Without really scrutinizing the game, I think the line play was better for the Colts. The unit seems to perform better with Mike McGlynn at center (instead of Samson Satele at center with McGlynn at guard). Joe Reitz started in McGlynn's usual guard spot, but ended up leaving the game with an injury. Xavier Nixon stepped in and seemed to play well. Luck was hit less this week (and Pep Hamilton rolled him out several times) and seemed to have a solid pocket for most of the game. He was sacked one time. Pressure! The Colts called a very aggressive game on defense. They brought in Bethea on a couple of safety blitzes and generally did a good job of putting heat on Keenum. Bjoern Werner came in unblocked for a sack while Erik Walden, Cory Redding, and Bethea also had sacks. The Colts were in Keenum's face all day, sacking him four times and hitting him eight. Fake punt? Double reverse? The Colts tried some different things this week, including an odd fake punt near midfield and a double reverse that gained nothing. I liked how the team tried to change things up a couple times. With their playoff position assured, they're trying to work out the kinks before the postseason. Speaking of the playoffs... The Colts are the fourth seed right now, but losses from the Patriots and the Bengals opened the door for the Colts to get the second or third seed. The former isn't likely to happen, but if they could climb to the third spot, they'd host the last team to get into the playoffs instead of Kansas City or Denver. Second half coma. The Colts were not very exciting in the second half, but they didn't have to be. We saw some good things from Richardson after Donald Brown left the game with a stinger. The defense was rock-solid, so no complaints there. I'd prefer that the Colts had a more efficient second half on offense (they were abysmal in third down situations and produced only a field goal thanks to a punt return by Whalen and a safety from...the defense). Da'Rick Rogers, week 2. Not a whole lot to say about Rogers in his second week. He caught a pair of passes for 23 yards and ran once for no gain. He wasn't likely to have a big game after last week, but a lot of fans wanted more. By the way, Coby Fleener was only targeted once this week and finished without a single catch. T.Y. Hilton. The first pass of the game went to T.Y., and it was clear the Colts figured him into their game plan this week. He had a fantastic grab on a 41-yard catch and dropped a ball that looked like it would've gone for a long way. He finished with eight catches for 78 yards. Saving the best for last. 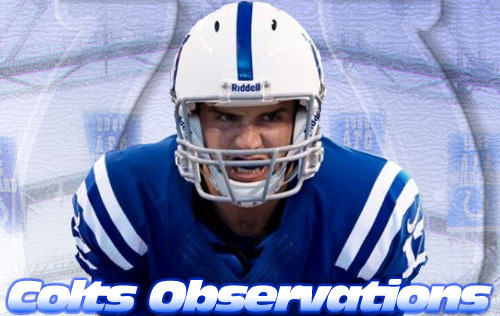 Fans should take the time to enjoy watching Robert Mathis. He set the franchise's single-season and career sack marks when he blindsided Keenum for a signature sack-fumble that resulted in a safety. The play recalled Mathis' sack-fumble-safety of Peyton Manning in the Broncos game. Many are making the case for Mathis as Defensive Player of the Year, and he certainly has my (non-existent) vote.